Trip Mission – OCF is offering the spiritual opportunity of a lifetime: a Real Break trip to Jerusalem. 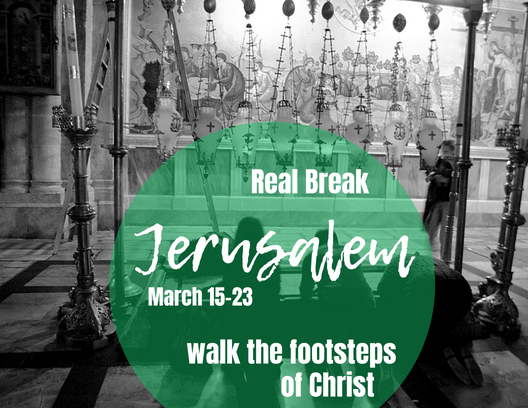 Real Break Jerusalem will afford team members the opportunity to walk the footsteps of Christ, as well as visit historical and spiritually significant sites to the three Abrahamic religions. Team members will also meet the “living stones” of the Holy Land, the local Christian population. Orthodox youth from America will partner up with the local Orthodox youth in the Holy Land on a joint community service project, which will be decided by the representatives of both groups as the visit nears. The team will spend one week visiting Jerusalem, the Galilee area (Nazareth, Cana, Mt. Tabor), Bethlehem, Beit Sahour and Jericho (the oldest city in the world). NOTE: St. Sabbas Monastery in Kidron Valley is a male only monastery. Real Break Jerusalem will schedule a tentative time to allow males to venerate the relics of St. Sabbas. Women will view the monastery from the designated look-out point.